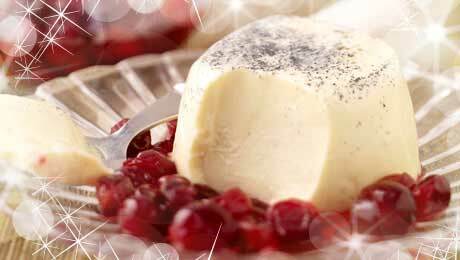 A pannacotta is a very simple dessert to make – the cranberry compote adds a seasonal twist. Place the cream, sugar and vanilla pod into a large saucepan and bring slowly to the boil. Take the boiling cream mixture off the heat. Remove the vanilla from the cream. Using a sieve, strain the water off the gelatine. Give it a good shake to get rid of excess water and add it to the boiling cream mixture. Whisk continuously to ensure that the gelatine has broken down fully and is incorporated into the mixture. Divide the mixture between 6 ramekins (no need to fill them up fully as the mixture can be quite rich) and transfer to the fridge to set for 5-6 hours or overnight. In a small saucepan, add all the ingredients together and cook on a low to medium heat for 5 minutes or until the cranberries have softened. To serve, pour the compote over the Pannacotta.